Is it yet another alien abduction claim? Did a cow try and communicate to you through sign language? Perhaps you awoke to a poorly-dressed Santa Claus impersonator rifling through your fridge at 2 a.m., claiming that he “was just around for the holidays.” Jokes aside, over the years, the insurance industry has experienced more than its fair share of bizarre and outlandish insurance claims. There have been claims documented by insurance companies that make the above claims look relatively mild (and even sane) by comparison. Curious about what some of these amusing insurance stories look like? Well, you’re in the right place! At Bradley’s Insurance in the Stittsville and Ottawa areas, we’re hardly in any position to judge your situation, even if your claims do sound rather…interesting. To protect you, your life, and your valuable assets, our Ottawa personal insurance brokers offer a number of comprehensive personal insurance policies to give you the peace of mind that you deserve. From niche personal insurance policies like snowmobile insurance (perhaps not so niche for us here in Canada), seasonal home insurance, watercraft insurance and many more insurance services, we take your insurance matters just as seriously as we’d take our own. That’s the Bradley’s way! 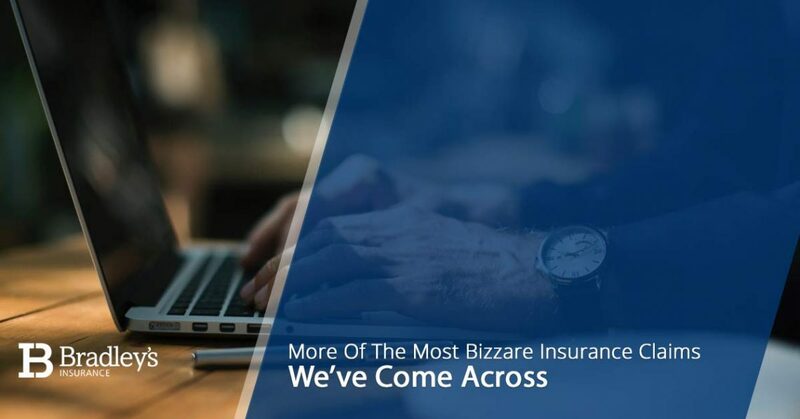 So, if you’re looking for an entertaining read about flat-out ridiculous insurance claims — a continuation of our previous blog post on the matter — we’re glad you’re here. Continue reading more about these novel claims below, and as always, feel free to get in touch with our personal insurance brokers in Ottawa to learn more about how we can better serve you and protect your life. Who knew that the cause of engine problems could be chalked down to fried potatoes from a fast food joint? Though it’s not your local mechanics most feared issue, apparently curly fries can wreak more havoc than you’d think. Awhile back, a Pacific Northwest resident and her elderly mother returned home after a day full of appointments, picking up some of their favorite fast food on the way home for dinner. While helping her mother out of the vehicle, the bag of greasy goodness fell out of her hand and onto the driveway — down went the curly fries. Instead of immediately attending to said fries, the two decided to go inside. With the intention of cleaning the mess afterward, the woman’s husband went outside, only to find that the fries mysteriously vanished. Assuming that a crow or raccoon picked up the ground score, he didn’t think anything of it. That is, until the lady’s check engine light came on a few days later. Sure enough, after digging through the engine to diagnose the low engine power issue, it was discovered that the bag of fries was lodged in the corner of the engine. Apparently, this tantalizing snack lured a mouse to the warm engine area to enjoy its newly-found dinner. However, it wasn’t the fry placement that caused engine issues — in reality, the mouse chewed through some of the electrical wiring. Moral of the story: pick up your fries. Given how many elderly people embark on cruises, perhaps this claim is a little more believable than the last. It’s also pretty common to lose your baggage while traveling, but have you ever lost a pair of dentures before? Apparently, one man filed a lost baggage claim on the grounds that his dentures fell into the open ocean. While on vacation, the man got a little seasick, and…well, you can probably fill in the rest. While it’s hard to precisely determine what constitutes as baggage and what doesn’t, his insurer complied with his claim. Who could possibly be upset at a puppy? Well, if your puppy causes extensive water damage within your apartment, that cute face and those seemingly-innocent eyes only go so far. New parents of this puppy apparently went out to run an errand, promising that they wouldn’t be gone too long. Stocking their bathroom with food, water and chew toys, they closed the door with the intention of keeping their pup safe. However, with dogs being the curious and exploratory creatures that they are, the puppy allegedly leaped onto the lid of the closed toilet, jumping into the sink. The way the puppy landed in the sink caused the sink stopper to go down, and of course, the water was also turned on. So, the owners came back to discover water flowing rapidly from their second floor down the walls and to the stairs….a less than pleasant discovery. Fortunately, the couple was able to get coverage through “sudden and accidental” damage — which it certainly was! Important note: the dog was completely fine the entire time. We don’t mean to come across as crude in any respect, but our personal insurance brokers in Ottawa do think that the notion of insuring certain parts of your body is very interesting, to say the least. Well, if you’re famous, fabulous, and you’ve apparently got quite the valuable “behind,” then you might be Jennifer Lopez. Indeed, at one point, J. Lo had (and still might have) an insurance policy worth $27 million for her rear end. If you’ve got it, you might as well flaunt it…and insure it. On average, it is understood by major insurance providers around the world — especially those that specialize in travel insurance — that falling coconuts kill some 150 people around the world every single year. That seems pretty ridiculous, but if you consider how heavy and hard coconuts are, coupled with the fact that they’re falling from pretty high up, it starts to make sense. It’s pretty ironic, if anything, given how healthy coconuts have proven to be for the human health. Coconuts falling have become such an established freak phenomenon that the insurance company Travel Agency Club actually decided to include “injuries by falling coconuts” into their insurance policies. In Hawaii (naturally), a police officer was struck directly on the head by a falling coconut while walking on a sidewalk. Fortunately, he survived but also sustained injuries, receiving $39,000. While we don’t come across insurance claims quite like this here at Bradley’s Insurance, we do understand that “life happens.” To us, that means being willing to hear out our valued clients in order to better tailor you with the appropriate personal insurance coverage. If you have a unique situation or you’re just looking for generalized personal insurance in Ottawa, Stittsville and other areas in Ontario, we’re here for you! Contact Bradley’s Insurance today with any questions. Discover How Bradley's Can Help You!